A lot of small dog owners never leave home without their furry friends. And why should they? Most little dogs make great travel companions. But despite their infinite portability, it's not always easy to keep your small dog safe and happy while you're on the go. Having the right gear can help with that, though, and it's bound to make your journey more enjoyable as well. One of the most important pieces of gear for a road-tripping pup is a good car seat or some other canine car-safety device. For diminutive dogs that like to be snug and secure in the car, consider a cushioned and flexible crate for the car. For those that like a bit more freedom and the ability to take in the sights while cruising down the road, a harness might be a better choice. 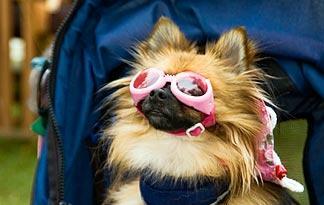 There are also many great gadgets that can make participating in travel activities with your pet easy and fun. Going biking with your petite pup? Keep him close with a doggie bike basket. Unlike Dorothy's little bike basket in "The Wizard of Oz," these doggie devices are actually designed to keep your pet safe and secure. If power-walking is more your thing, you may want to consider a pet stroller. Like bicycle baskets, most pet strollers have harnesses and/or enclosures that prevent your precious canine cargo from falling and jumping out. They also allow your little friend to rest in a nice, shady spot while you enjoy a brisk stroll. Dressing for SuccessSince small dogs may not be too well-equipped to withstand the elements, you'll also want to bring along canine-specific clothing that's appropriate for the different environments your small pooch may encounter. For example, if you're headed to the ski slopes, pack a warm sweater and some doggie booties. Going boating? Don't forget a pup-approved life jacket or float coat. If you'll be active at night, consider taking a reflective vest to keep your small dog safe. These items are sold many pet stores, as well as camping and sporting goods stores, but you may find a larger selection with online retailers. One fun travel activity to do with your best four-legged friend is go on a camping trip together. Many energetic dogs, after all, are happiest when they're outdoors with their owners. Fortunately, there is plenty of great gear designed to make camping with your spunky small dog safe, convenient and enjoyable. Camping trips often involve hiking, which most dogs love. But it's important to keep in mind that small dogs tire quickly. That's why one of the coolest camping accoutrements to come along recently is the backpack dog carrier. It's a lot like a backpack-style carrier for children, only these are specifically made for miniature mutts. In addition to exercise, though, camping usually includes a good bit of lounging. For these leisurely moments, your little dog may need a bed, chair or other comfort gear created specifically for canine campers. Also, consider getting your pet a tent of his own. This can double as a safe place to put your little loved one in case you need to leave him for a moment -- though a collapsible crate may work just as well. Never take your small dog camping without a few practical tools for keeping him safe and healthy. The ideal survival kit for a pint-sized pup includes bandages, wound spray, skunk odor neutralizer, tweezers for tick removal, insect repellent made particularly for pooches and a life jacket designed for small dogs if you plan to camp near water. Many of these things can be found online, but larger pet stores and sporting goods stores may also carry them. Finally, remember that small dogs have a lot in common with small children -- both need plenty of rest after periods of exercise or excitement. If your camping trip involves hiking, swimming or other forms of heavy exercise, allow for plenty of down time for your itty-bitty best friend.